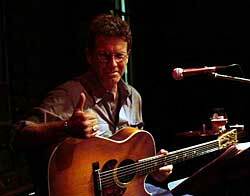 Just got back from another John Vester gig, in De Waag in Amsterdam and I thought I'd share my experiences. De Waag is a very beautiful old place. Right where dead people were being cut up by surgeons, John played his beautiful songs. 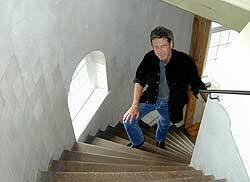 When Hanne, Marlies, Marjolijn and I arrived upstairs, we were greated by John. There were about 30 or 40 people. A pretty quiet audience, that appreciated this music. At 9 he started playing and again it was a very nice mix of beautiful songs, very funny numbers and anecdotes. This time there was no coffeemachine to disturb the music, but something that sounded like Santa's bells. That was weird. But to top it all, was when it started raining as John started singing his rainsong (title slipped my mind). Cracked us all up and John was trying hard not to laugh and to continue singing. So, if you're able, please do try to go to one of his shows. And if you're not quite sure and first want to read and hear what John is all about, check out http://www.johnvester.com. For those who were sorry there weren't with us tonight: there might be some footage of the show on John's website soon. Tonight at this very special and very old venue in the heart of the centre of Amsterdam we were witnessing another great show of John Vester. Another place I've passed many times on my bicycle, but never ever have seen inside: De Waag (where in the Middle-ages merchandise was weihged, as were people and witches). We had to climbe two whole stairs (!) to enter a round room at (almost) the top, at which Rembrandt painted his famous painting the Anatomy Lesson. John remembered our faces from his first gig in Hardenberg and was happy to see us again. He was seated beneath a text on the wall, which told in Latin and in old Dutch about the corpses of criminals, which were cut open in that very room, to serve science. The words above him said something about the dead and mute bodyparts. That was already a funny kick-off! at De Waag in Amsterdam. There was more eyecontact with the audience, and quite some smiles here and there, and he was very cameraconscious! Yes, the whole thing was taped. When he was playing a certain song, the sound of a babyrattle or something like that came through the open window from the street. It was out of rythm and was a bit annoying but also very funny. And when he sang 'Greatfull for the rain' it started pouring down right at that second! Tears were running down my cheeks from laughing. It was a completely different audience in comparison with Hardenberg. Quieter and more polite, no singing along (exept for the four of us), almost solemn, so he left all his f(peep)k you -jokes behind! After the show we (Marjolijn, Marjolein, Hanne and me) stayed in our seats talking about the show (and lost loves), and John joined us in talking about the show and stuff. It was great fun. It's easy to talk to him, no troubles or shakes at all, like I always have trying to get just one word out to the Lennons. If we ever go to California, we were invited. Wow! But I probably will never go there, though Hanne will this summer! We said our goodbyes and John called us his first Dutch diehard fans. If I was able to, I certainly would try to catch another show! ps. drink a bottle Whiskey(or two) before you tape "Where is my woman" for your next album! 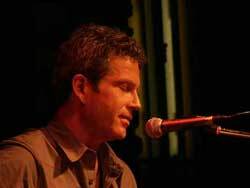 Just got back from the John Vester show in the Troubadour in Hardenberg. I bought both cd's, but unfortunately I don't have a cd player in my car, so to keep the spirit of the evening I just sang (as little words as I know) 'You're the one' over and over. Beautiful song. When I arrived at the Troubadour alotta familiar fans were already there, enjoying the sun on the porch. It was a shame to have to go inside again, but it sure was worth it. 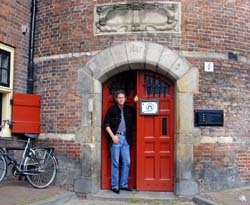 posing at the entrance of De Waag. Around 9 John started playing. He was very nervous, looked only on his sheet music at the beginning when he talked to the audience, but that faded. I've hardly heared anyone with such dry humour. He's even dryer than a Martini. Sometimes his voice fell away in the noice of the koffie machine, but John said it sounded like the crowd was going wild, haha. The wave was the only thing missing, I guess. He played his songs, old, new, Venice and experimental songs, just as he felt fit; no setlist at all. And when he didn't hit the right note at the beginning, he just started over. Sounded very familiar :) He'd already heard from the Venice guys about us Dutch fans singing along so enthousiasticly, but he was very amazed when we al sang along with 'We're still here' in our Dutch fan way. And no matter how shy the guy is, he gladly took the time to sign his cd's and posters and to have a chat with some fans. Well, there's probably much more to tell, but it's bed time for me. Tomorrow there sure'll be others to give their impression of tonight's show. I'll fall asleep with the knowledge that I've added some interesting music to my collection. Vester in Hardenberg: How Humble! 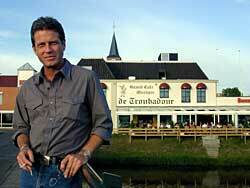 At about 6 p.m. we arived at The Troubadour, which is build in a curve near the river De Vecht. A beautifull venue, where we could sit outside in the sun and we ate and drank a little to pass the time in company of a growing group of Venice fans and- friends. His promoter looked at his watch, John had to start his gig, but he just kept talking to every one who was at the merchendise table, so the promoter came outside to the terrace to tell us the gig would start half an hour later. It was clear to John there was a bunch of Venice fans, and he learned from them that we like to hear the idea behind the songs, so he started every song by telling a little story about it. He's sometimes quite a naughty guy I must say! He made lots of little jokes and some of his songs are little jokes by themselves! John played a couple of songs of his new album, some Venicesongs and some songs he never recorded before, just to try them out. And those were little jewels, so John, don't throw them out, but put them on your new album please! He also played a song (don't remember exactly which tiltle it has, was it Unbreakable Heart? ), which apparently will be recorded at the Bahamas by Venice for their upcoming cd. My friend and I joked that we already could hear Mike going wrong at the little guitar solo's and see Kipp's 'angry' lookes at him (sorry for my terrible english at this part but it is in the middle of the night overhere and I should be sound asleep by now!) ! So we'll just wait and see! John plays lovely straight forward songs, with lovely lyrics. It amazed me how simple he can translate his feelings and emotions into littlte treasures of songs, or sometimes in short strong words tell us how shocked he has been by something that happened to or around him.